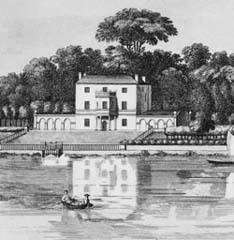 Dr William Battie (sometimes Batty) is known in Twickenham as the owner of a house on the riverside which he had built for himself in about 1740 on the site of an earlier house (latterly known as Lord Denbigh's). This house had burnt down in 1734 while in the occupation of the French Ambassador. 'Dr Battie's', as it was known was later named Poulett Lodge. He lived here until 1759, when he sold the property. William Battie was born and baptised on 1 September 1703 at Modbury in Devonshire where his father, the Rev Edward Battie was vicar, having formerly been a master at Eton College. After attending Eton himself as a King's Scholar William went on to King's College, Cambridge where, frustrated from reading for the Bar he studied medicine. In 1730 he obtained a licence to practice and to lecture on Anatomy. Horace Walpole attended some of his lectures. Shortly after, he obtained a post as a physician in Uxbridge through the influence of cousind, where he achieved some prosperity, augmented by a £20,000 legacy from a relative. In 1737 he moved to London having taken the Degree of Doctor of Medicine at Cambridge. Battie, in fact, was appointed Physician to St Luke's Hospital for Lunaticks when it was founded in 1751 opposite Bethlem Hospital, where he had been a Governor since 1742. Later he became the proprietor of a large private asylum for the insane in Clerkenwell. He enjoyed a long relationship with the College of Physicians, beginning in 1737 when he was appointed a Candidate and a Fellow in the following year. He held several College offices during his career including those of Censor, Elect, Consiliarius and finally became President in 1764. He died in the night of 13 June 1776, and was buried in Kingston Parish Church, “without any monument or memorial whatever”, next to his wife whose father, Barnham Goode came from Kingston. He left a substantial estate consisting of his house in London and properties mainly in Eton, Cookham and Great Marlow; first to his then unmarried daughter Anne and successively to his other daughters Catherine (the wife of Thomas Rashleigh) and Philadelphia (the wife of John Call). He did not retain any property in Twickenham. Walpole estimated the value of his estate at £100,000. 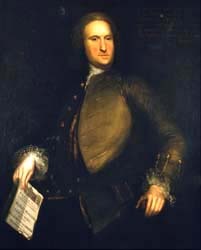 Anne subsequently married Admiral Sir George Young (1732-1810) who enjoyed a connection with John Call and presumably went to live with him at his estate, Formosa Place in Berkshire. He had a long relationship with the College of Physicians beginning in 1737 when he was appointed a Candidate. He held several College offices over his career including those of Censor, Elect, Consiliarius and became President in 1764.